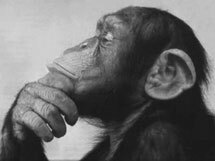 Can a monkey really pick stocks that can outperform the markets? Since becoming involved in the StockWatch share trading game we have seen some people with a very limited understanding of the stock market produce some impressive results, even outperforming those with a more strategic approach. So we have to ask ourselves this question. Can a monkey beat us at our own game? Going by the success of Mr. Adam Monk (an actual 35-year-old cinnamon-ring tail cebus monkey from Brazil) a stock analyst for the Chicago Sun Times, yes...yes they can. But we want to see it for ourselves. Unfortunately, due to local quarantine laws (amongst others), we are unable to secure our own monkey to put this to the test. What we have done instead is carry out the dartboard test using an actual dartboard, the top 200 companies and our mediocre dartboard skills to pinpoint 15 random companies from the Australian Stock Exchange (ASX). We will call this player, Mr. Samuel Monk. So there you have it. 15 random companies, each with roughly $3300 in stocks, so we can now compare the performance of our well respected Mr. Samuel Monk to our own strategies and rankings on the leader board. To see how Mr. Samuel Monk is progressing click here! Below are the shares that Mr. Samuel Monk has picked.